The Vought OS2U Kingfisher was a United States Navy observation floatplane during WW2. The Kingfisher first flew in 1938, but was not delivered to the Navy until 1940. In its operational history, it was used as a catapult-launched scout plane on heavy cruisers, light cruisers, and battleships of the U.S. Navy. A total of 1,519 OS2Us were made, with some used by the RAAF, and the FAA through the lend lease act. 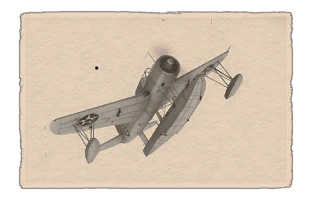 Use this plane as a ground attack aircraft, by equipping the two 100 lb bombs. 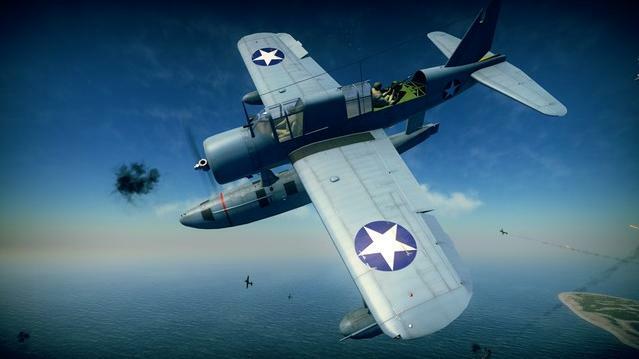 The OS2U is a fragile plane, so your best advantages are the bomber spawn height, and the deadly rear gunner. In Arcade, to make the most out of its Battle Rating of 1.3 , play it only with Reserve planes. This way, you will often be placed in Reserve maps by the matchmaker. drop your bombs on AAA and Artillery, but make sure you have room to climb up without crashing. Defense - The back gunner of the OS2U is very accurate and will often set fire to enemy planes trailing behind you. If you are not occupied with targeting ground units and an enemy is sitting on your tail, switch to the gunner view and aim at the enemy pilot and/or engine to try get a pilot kill or start a fire. In order to use the OS2U-1 to its full potential, first unlock the bombs, then go down the flight performance as well as the survivability tree, saving the Weaponry improvements for last. Engineer and designer Rex Beisel incorporated innovations becoming the first production type to be assembled with spot-welding to create a smooth fuselage that resisted buckling and generated less drag. Beisel also introduced high-lift devices, spoilers and in a unique arrangement, deflector plate flaps and drooping ailerons. The first prototype flew in 1938, powered by the 450 hp Pratt & Whitney R-985-4 Wasp Junior radial engine. 2 years later, the first production OS2U-1s were delivered to the U.S. Navy. The Kingfisher was the U.S. Navy's primary ship-based, scout and observation aircraft during World War II.